Each line in the 1551 descrizione refers to a household, i.e. a group of individuals organized under a single named individual. The 11,743 households listed in this urban population survey have been translated into database entries comprising twenty-seven separate fields. The data contained in these fields can be categorized under two headings: demographic and spatial. When viewing the 1551 census material, it is important to keep in mind that a distinction existed between a hearth (fuoco), which referred to some division of real estate, and a household, which was recorded as a unit of population. 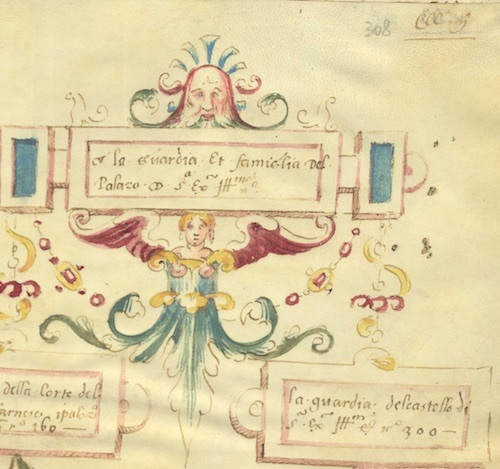 Each line in the descrizione lists the name of a head of household, followed by the number of hearths occupied by that household and then the number of individuals present in that household. Rarely, however, more than one household could reside within the same hearth. This is the case for 2,292 entries in 1551. Fuochi: This contains the number of hearths occupied by a family, always either 0 or 1. If the value is 0, then this household was co-resident with one or more households. Contained_In: If the value in Fuochi is 0, this field contains the Serial number of the entry with which this household was co-resident. In case more than two households were co-resident, all households after the first will list the same initial household in this field. Bocche: At the most basic level, each entry includes the number of ‘mouths’ (bocche) found on a given property, i.e. the male and female occupants. Maschi, Femine: These fields total the inhabitants of non-servile status, described by Del Muccione as padroni and padrone. MasServ, FemServ: These fields contain the individuals described as servants/slaves (servi and serve). Each entry lists at least one name, that of the main head of household, and may include a name or description of another resident in the same household – i.e. a brother or daughter. These names may be brief, giving no more than the cognomen, or highly descriptive, including an individual’s surname, patronymic, and occupation, among other things. Household_Main: This field lists the main head of household owner of the property. H1_Type: A category field denoting whether the head of household is either Female, Male, Hereditary, or Ecclesiastical. H1/H2_Title and H1/H2_Occ: These contain the title – ser, mona, etc. – and occupation of the associated individuals, when available. H1/H2_N1: Cognomen. The names of institutions are also entirely contained in the N1 field. H1/H2_N2: Patronymics are typically found in this field; in the case of widows or women identified as wives, this field contains the husband’s name. H1/H2_N3: This field captures additional monikers, like nicknames, surnames, and avonymics. H1/H2_Top: This field contains any toponyms listed for the named individual. Note: For widows or daughters identified with their husbands or fathers, the information in N2, N3, Occ, and Top may refer to the male associate rather than the named woman. There are only a couple of pieces of information in this category. Quarter: The quarter of the city (S. Croce, S. Maria Novella, S. Giovanni, S. Spirito) within which the household resided. Street: The name of the street along which the household was situated. Besides these basic features, the 1551 descrizione contains little information about the location of a given household in the city. In the interests of sharing our data, the DECIMA app has spatialized the descrizione as accurately as we currently can, which means that most entries are contained as aggregate tables within features representing streets. It is fairly clear from correspondences between 1551 and 1561 that Del Muccione’s fair copy was produced from notes prepared along similar lines as the later ricerca. Certain residents who appear in sequence in 1551 are listed in sequence, or reverse sequence, in 1561. With further research, it may be possible to localize many of the entries from 1551 by reference to corresponding entries in 1561, which can be identified with greater precision.